My oh my, I am loving the sun the past few days. 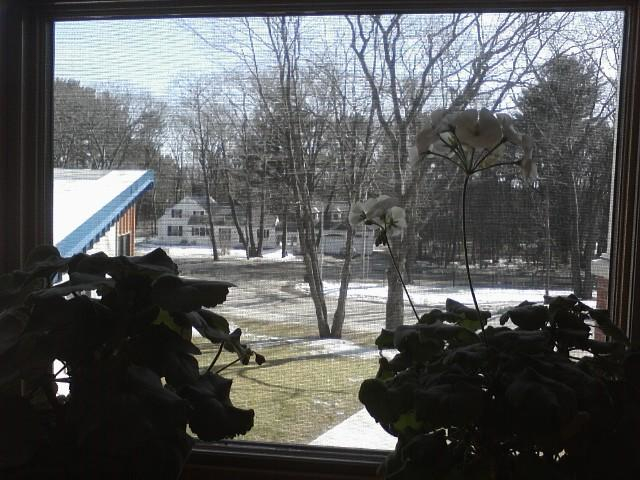 Sun shining + snow melting = happy me! Today was the best day by far. The temps were near 60F today (in Maine) and that is just fabulous. Really fabulous. Days ago when the forecast was calling for such gorgeous weather, I told Ward "on Thursday I'm just going to run forever that day, okay?" I didn't run forever, but I did get out for an 8.11 mile run today afterschool. Gotta love that it's lighter later. Much easier to get in a run afterschool. Oh happy days! Tonight's run was not speedy at all. It was just right. I had my speedier runs the past two nights, so tonight's run was just to get out and enjoy wearing shorts, my badass socks, a light weight shirt and headband. Get this - NO HAT and NO GLOVES! It felt weird but awesome. I did not bring Pepper but I did bring my cell phone. Last night I made the mistake and did not bring my phone with me (but did bring Pepper). But a creepy thing happened. A truck drove past me three times and the sketchy guys in the truck were totally making it obvious they were checking me out. So gross and completely scary. This morning, on my way to drop Izzy off at daycare, I was on the lookout for said sketchy truck and I FOUND IT. I know where they live. I told Ward about it and I'm going to find out more about these guys. I'm also going to be talking to my daycare provider's hubby (the county sherriff). AND I will not be running down that way for a very long time. AND I'll be bringing my cellphone with me on runs. What else would you do? Next up, I want you to notice the lack of snow. Yes, there is a small pile behind the boys. I also want to note that when I left for school this morning, we had a quite a bit still on the ground and now look! Welcome mud season. I dislike you but I love what comes just after - sandal season! Now I have to get up in the attic and find my sandals and capris and skirts! LOVE this! Now I want you to notice that Ward finally tapped the maple trees. A little late, but we should still get a few bottles out of this. There is something just incredible about making pancakes and/or waffles and topping them with maple syrup you made yourself. I am sure it tastes far better. Now onto the Photos of the Day. I haven't been good about daily posting. I'm trying. I really am. Day 7 (yesterday) - Something You Wore. I know it's getting warmer but I still really love coming home, taking off my shoes and putting these on. They are by far the most comfortable slippers I've ever owned. And they are local - LL Bean. Love this. Day 8 (today, of course!) - Window. At first I took this picture. 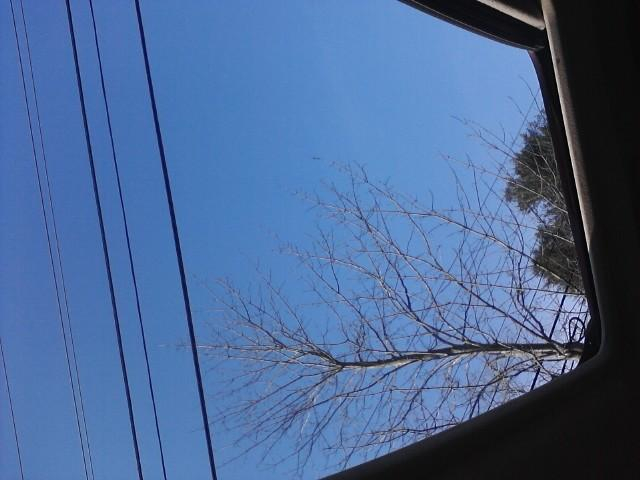 It was my view of today's gorgeous weather from my desk. I was jealous of the runners/walkers out there today but I didn't say any naughty words about them at all. I knew I'd be able to get my run in. Then on my way home from school, I opened up my moon roof because that's what you do on the first awesome weather day and looked up and saw the gorgeous sky. eww for creepy truck guys. Why do they think they are all cool being jerks like that. Be careful that is so freaky. on the other hand yay for nice running weather. We are supposed to be in the 60s this weekend! So glad the days are getting longer and the weather nice. Yes, watch out for sketchy guys. Glad you have a friend who is a sheriff. Such a good idea to report it. Let's hope that will be the end of it. I have heard that it is a good idea to vary your running routes, days and times. Guess this is why! It's good that you know where the sketchy truck is from - that's certainly better than not knowing at all and having it happen again! Posts like this remind me how spoiled I am with our warm weather here in Florida! That stinks on the creepy guys. I'm glad you are going to do some digging. I live in a very suburban area and don't have to worry about that kind of thing too much--it all changes when you are more rural and isolated. Loving the weather here too (I'm in Md). It hit 72 degrees yesterday. Might have done two runs, myself! Always better to be safe than sorry when it comes to creepy guys. Stay safe! Boo to creepy guys! but yay to warm weather!! I'm in NEPA, so we have similar weather, well, my warm day was yesterday, and today was chilly again. But I LOVE the warm weather. Although I haven't dawned shorts yet. I have scarey legs. In fact I probably scare off weirdos with them. I actually carry pepper spray with me on all my runs for weirdos and animals a like. I have one with elastic around my hand so it fits comfortably without my having to hold it the whole time. Be careful Jen, which I know you will be! Creepy guys are the worst, I always give them dirty looks which probably gets me into more trouble! I love that the weather is getting warmer, I'm ready for spring/summer! ugh, creepy guys are horrible! make eye contact, that's for sure... seems to steer them away. do you bring mace? definitely bring your phone too. i'm always paranoid, especially since SUAR & Sherry. on a positive note, so glad the sun's out! 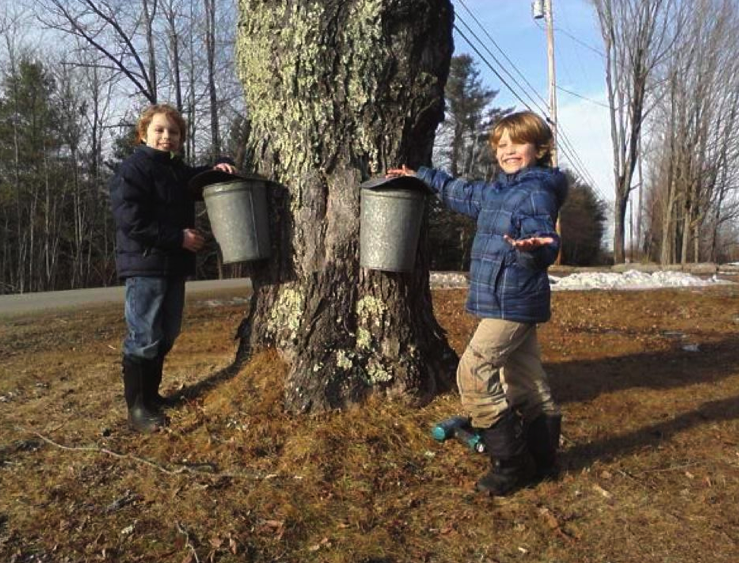 Love the maple syrup pics! We used to do that in NY... always a nice sign that spring is on the way!